A character named Muggs is carrying $500 in bail money with which to spring a Dr. Leach from jail. The Marxes want Leach to stay where he is, so they decide to convince Muggs to bet his wad on a sure loser. Chico (in a bit more true-to-life than usual) scours the track for tips and finds ten of them -- one for each horse. "Should make racing history," he remarks; "Ten horses in a dead heat." So they substitute a plowhorse for number 10 and put Harpo aboard, and bet Muggs' money on that. 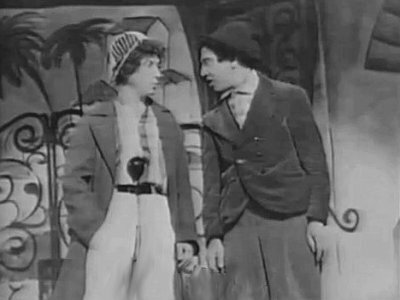 Chico tells Harpo: "At the first quarter, you start holding him back. At the second quarter you start holding him back still more. The third quarter, I think maybe you better tie him to a post." Unfortunately, as it turns out, the race has been rigged in favor of number 10, leaving the other nine jockeys trying to figure out how to stay behind a horse that isn't going anywhere. Irving Thalberg, upon reviewing the draft, liked the bit about the racetrack and suggested expanding it, so gradually with further drafts it took over more of the plot. Louvish has discovered some similarities between the final plot of A Day At The Races and The County Fair, a stage hit from the 1890s which featured Uncle Al Shean. The show ran for over three years and starred its co-writer Neil Burgess in cross-dressing mode as Abby Prue. Prue is unable to pay off the mortgage of the farm but has a horse of unexpected speed in the barn, a horse that'll win the race and enough money to bring the play to a happy end. The big attraction of The County Fair was the final racetrack scene, set on a treadmill, with real horses, a real waterfall and a real, 18 feet high tree on the stage. Uncle Al sang a solo in the corn husking scene, rode a horse in the third act and handled props between times. Bert Kalmar and Harry Ruby wrote a song for "Quackenbush" in the Vaudeville tour. After dropping the "Q" when real-life Quackenbushes was discovered in the medical world, the song was intended to a introduce Groucho in the film as Dr Hackenbush. However, this scene was apparently never filmed. 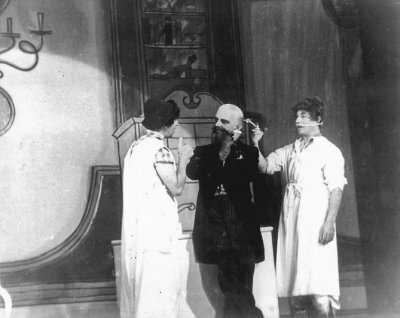 Groucho's son Arthur claimed Groucho was only too happy to delete it, since filming such a production number was always rather taxing and would presumably have been especially so with Sam Wood in the director's chair. However, Groucho made a version on record in 1951. Glenn Mitchell also mentions a 16 mm Kodachrome reel in private hands, which - although it's silent - shows Groucho singing the song in the Hollywood Victory Caravan during WW2. Another song that was cut was Allan Jones' love song from the very beginning of the film, A Message From the Man in the Moon by Bronislau Kaper and Gus Kahn, which was relegated to incidental music during the water carnival and a very short reprise by Groucho in the finale. Even after the filming was finished, scenes were cut in order to bring the film down to a manageable duration. A published script, which like A Night at the Opera's equivalent offers pre- and post-release versions, records some of these lost moments. Prior to Harpo's examination by Groucho, there's a cut scene with him at the sanitarium. Among the other patients is a little girl who throws a tantrum when presented with food. 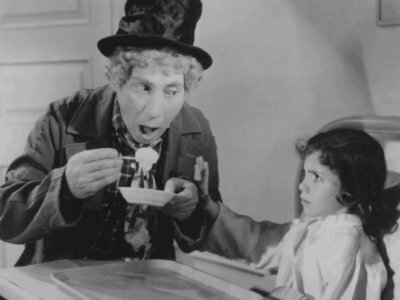 Harpo tries to coax her into eating by taking a spoonful of icecream, but the kid squawks. The girl hits Harpo with a balloon attached to a stick, but the balloon becomes detached and deflates. When the child starts bawling, Harpo attempts to pacify her by re-inflating the balloon, but inhales too deeply and swallows it. 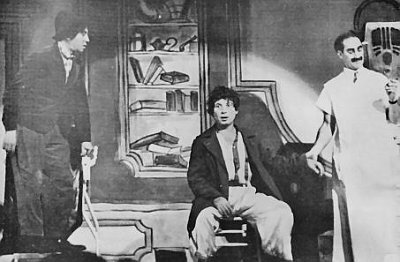 On the arrival of a nurse, Harpo hides beneath a bed, but when it is wheeled away, Harpo has vanished. Chico, outside in the corridor, looks for Harpo and is alerted by the sound of a taxi horn as the bed is wheeled past. Harpo is clinging to the underside of the bedsprings, hitching a free ride as the puzzled staff question the source of the noise. 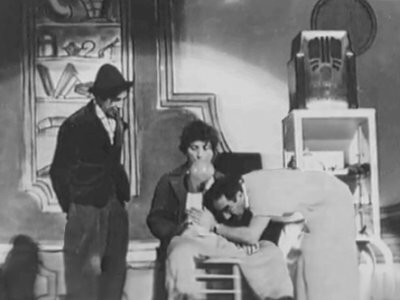 From here Chico wanders into a steam room, emerging to confront Groucho with news of a "patient" as in the released version. Other stills preserve deleted material from the Water Carnival, as when Chico and Harpo intrude themselves upon Groucho and party. They examine the contents of a chafing dish and replace it with a fish from Harpo's pocket. "Hugo!" cries Margaret Dumont, "Look what they're doing! ", but Groucho tries to ignore them in favour of a spoon-jumping trick he is attempting. 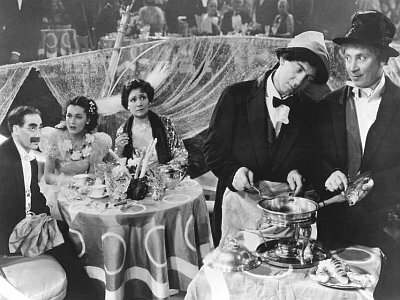 Harpo de-scales the fish with Dumont's lorgnette, while Chico builds the fire under the dish, dumping in various items, all the while dropping loud hints about horse doctors. Harpo's mayhem includes filling a pipe with food instead of tobacco, and swallowing a demitasse complete with cup. "I think they're cooking my goose", Groucho observes while his guests depart before the intruders join him at the table. The approaching Sheriff is their cue to leave. "I don't think we wait for dessert!" Chico says and Harpo catches the spoon that Groucho has been trying to launch into a glass, sending it down the back of Dumont's dress. 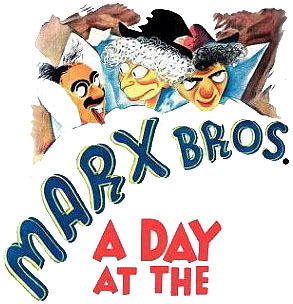 Another loose end is Groucho's reference to Chico and Harpo staying "down in that room with those pigeons", when none have ever been seen in the film or been mentioned in the pre-release script. 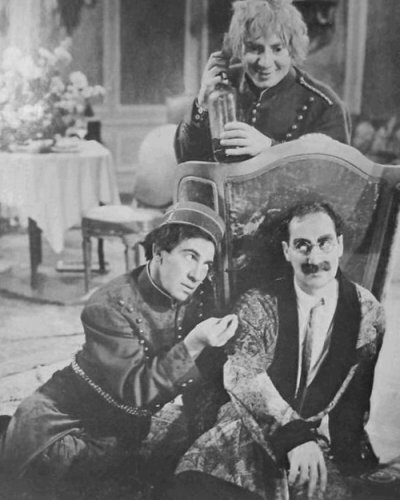 The scene when Groucho has invited Flo Marlowe (Esther Muir) to his quarters and Chico and Harpo do their best to prevent mrs Upjohn (Margaret Dumont) from discover this, have also been edited. When Chico first appears as the house detective, the dialogue suggests this to be a return visit. When Groucho calls for "the bellhop to hop up with some hop Scotch" in the finished film, nothing follows because of to the deletion of Harpo and Chico masquerading as bellboys. In the script, Harpo opens the door with an oversized master key and enters with Chico, who bears a tray with Scotch, glasses and soda syphon. As Groucho pours a drink, Harpo sprays soda not just towards the glass but all over the tray, from which it rebounds over Chico, Groucho and Flo. "Hey", says Groucho, "just fill the glass, not the room!" 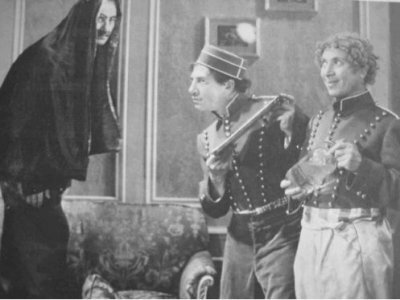 Groucho and Chico take refuge behind the sofa as Harpo attempts to stem the now uncontrollable syphon. They make for the table as Chico insists the woman is "no good". Groucho, caught sideways when the soda is placed on the table, claims "If this keeps up she'll float out". "This is no place for a man who hasn't been in the Navy" Groucho continues and pretends to have been persuaded to leave. He cons the others into doing the same but not before Harpo has thrown the syphon back in Flo's direction. Additionally, the trailer for this film also presents an alternate take of Groucho's and Flo's embrace in the scene. A Day at the Races was released 11 June 1937. Groucho If that's the case, I'll go! choir Oh no, you mustn't go! Groucho Who said I mustn't go? choir He's never lost a case! Groucho I've lost a lot of patients but I've never lost a case! Groucho A doctor's a mans' best friend! Oh-oh! A doctor's a mans' best friend! All A doctor's a mans' best friend! The lyrics above are as Groucho recorded them in 1951 with Ken Lane Singers And Orchestra directed by Victor Young. A special thanx to Robert and Anne for their corrections. Aug 12 & week San Francisco, Calif.